Ted Barton is the executive director of the British Columbia/Yukon section of Skate Canada, but to millions of people around the world he is the guru of the International Skating Union (ISU) Junior Grand Prix Series and the Junior Grand Prix Final. Known and respected for his insightful and balanced commentary of each and every skater, Barton has been covering the juniors the past four years. During that time, he has witnessed firsthand the growth and evolution of hundreds of young skaters — some of whom have gone on to become international skating stars. How did the concept come about to broadcast the junior events? It began when I was thinking about how best to develop young kids in rural areas in Canada. A 7-year-old kid in Vancouver is not the same as a 7-year-old kid in Terrace (a town located 840 miles — 1,350 kilometers — north of Vancouver), so how could we get them to see each other skate? Around 2010 or 2011, our organization bought a tri-caster and started streaming local competitions so, say, a young girl in a rural area was able to see a girl the same age skating in Vancouver … our hope was that she would say, ‘If she can do it, I can too.’ It was all about development. How did you present the concept to the ISU and what was the initial reaction? Peter thought it was a great idea and took it to the ISU Council. It took about a year or two to get organized. We had a meeting at Skate America in Chicago and Japan’s Asahi TV was there. The people from Asahi had also told Peter they were interested in the Junior Grand Prix. They knew Mao Asada, who had not then ended her career, would at a certain point and they wanted their television audiences to get to know the next generation and get them engaged in their stories. As we went along, we discovered all the kids had interesting stories and many were incredibly gifted, and this gave us a way to follow their growth not only as skaters, but also as people. As we went on we got better at what we were doing, and explored and found better ways to tell the stories. That was very important for us. The kids were all good in their own way, but the difference between skaters from Cyprus or Argentina and Russia or Canada was so wide — the challenge was to tell all the stories with respect. We found a good way to do that and we were pleasantly surprised at the response we received. We also started to see the gap between the juniors and seniors closing. What factors played a part in the growth of the viewership of this Series? Well, the first year we had 1.4 million views; the second year was 4.8 million, and the third was around 10 million. I think we are now averaging around one million viewers per competition. The speed with which we arrived at where we are now with viewership surprised us all. The main skating nations like Canada, the U.S., Russia, and Japan latched on to this pretty early because those countries have a lot of skaters competing at Junior Grand Prix events and they wanted to follow them. So, we had a sort of built-in audience to start with because those people were already engaged in skating. Then there were countries like Chile, Argentina, Kuwait, and Saudi Arabia that have skating communities, but some have no rinks. When expatriates or people who were connected with skating started watching, their colleagues, some who had never seen skating before, also started watching. We tracked the statistics of those non-skating countries and the growth every year has been outstanding. So, we were growing in the skating nations, but more importantly we were growing around the world, and the sport was getting exposure in places where people did not even know it existed. Sometimes during a broadcast I will ask people to let us know where they are from, and the responses come in like a machine gun. People from Malaysia, Turkey, Greenland, Azerbaijan — all over the world. To actually see that happening live on the site is very cool. We knew we had to have a long-term vision, to be patient and build things slowly. That is one of the reasons that this initiative took off and I think we are seeing results now. We wanted the sport to grow and today we are seeing many new countries joining the ISU. Also, the ISU is really good at getting information out about the Junior Grand Prix events with timetables of when each skater will compete, so if people want to watch a particular skater they know exactly what time that person will skate no matter whether they are in Russia or Buenos Aires. We have found that our audience has also grown because of that. 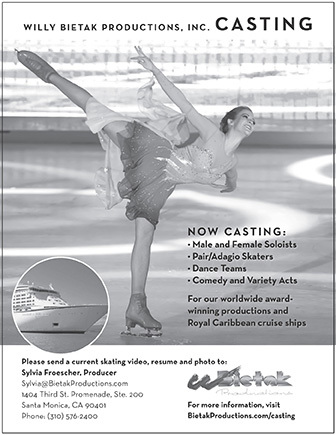 How do you think the broadcast benefits junior skaters? can be overwhelming — it will not be so intimidating. I think that is one very good aspect. When I first started doing this, I went with my heart and, in telling the stories of the juniors, people began looking at them differently. I remember when I skated I was pathetic to a certain degree. I was not particularly highly skilled, but I loved the individuality of the sport and I remember how hard and how difficult skating is. Then I had a couple of coaches who turned the switch on in my head. So, when I watch these kids I am hopefully offering encouragement, inspiration and that there is always hope, no matter how hard it seems. If I could do it — and I was a big ox, like a bull in a china shop — then they can do it. When I see kids from countries that don’t have the skills, but they are out there trying — like Princess Alexandra from Monaco, who was a beautiful girl and though she was not highly skilled, she loved skating — I get it. You do not talk during a performance, but recap the program after it is finished. Why did you take this approach? When I am watching skating and someone is talking about something that is irrelevant and not connected to the program I am watching I am like, ‘What are they talking about?’ It is so annoying. There is a way to cover skating — it is important to tell the stories without being negative or critical. You do have to be honest. A bad skate is a bad skate. Call it a tough skate or whatever you want to call it — but you don’t have to be mean. I try to choose the right words and I think that resonates with people. I have a huge responsibility to be honest and encouraging. The kids get off the ice and they go and watch their video immediately. They hear what I had to say, so I feel a responsibility to support what their coaches are teaching them, the parents who are supporting them and the money being invested in them. Skaters are not naïve. They know if they had a good skate or not and if they hear from us what their coaches are telling them — ‘don’t give up, here are some little things to improve’ — then there is something for them to build on. Would you say the level of skating has improved the past few seasons? If so, how? Yes, just unbelievable how much the level has risen in the past few seasons. Some of the young ladies are so efficient technically. People say they are going to hurt their bodies but no, their technique is so good it has very low impact on their bodies. If your technique is bad, then yes, you are going to get injured. But if your technique is good then you are going to be fine. As they grow their technique is going to get a little wobbly, but technique is technique and it is so well taught by some of these coaches today that these kids will keep it through puberty. We have already seen many of them move into seniors and be very successful. Why do you think there has been so much improvement? I would attribute the development of the junior skaters to the judging system, the concept of which was to hand control back to the skater. No one can say skating has not gotten better because the kids are now very strong technically and they are also very creative as well. One of the best decisions I think the ISU ever made was allowing vocals. It is much more entertaining and has really helped the sport grow. What do you think needs to change to bring skating to a wider audience? Skating needs to be more open to the world — the junior coverage is just one little door, but many more need to be opened. My hope going forward is that the sport will open up to the world for everyone to see. That currently does not exist except for the juniors. I would like to see other nations open up their competitions to the world — I would love to be able to watch Japanese or Russian nationals, and other competitions that are currently not available outside their respective nations. I am hoping that will change in the not too distant future.